Find other influencers in your region or within the same industry. 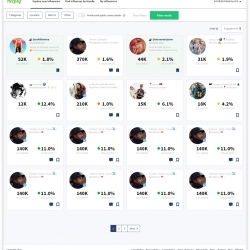 Use our filters to get results in minutes, we have the best tool for influencers. 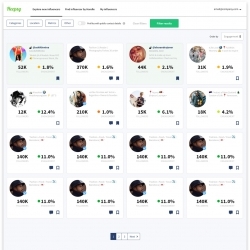 Heepsy is the best influencer marketing tool for influencers looking to find other people in the same industry or location. 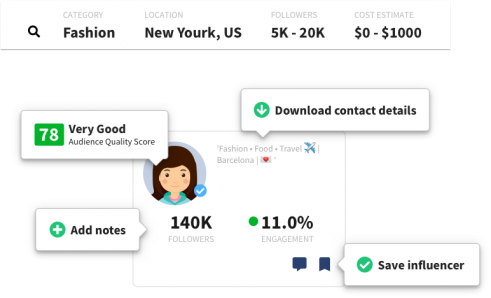 With Heepsy you can look up and contact influencers for you or your brand, no matter your niche or location, in a matter of minutes. Find the best influencers in your category or region. Check out what are their posting and how they engage with users. Grow your followers on Instagram and other social media channels. Contact with other influencers that are like you and make them an offer to promote your social media account. Find brands that are currently collaborating with other influencers like you. 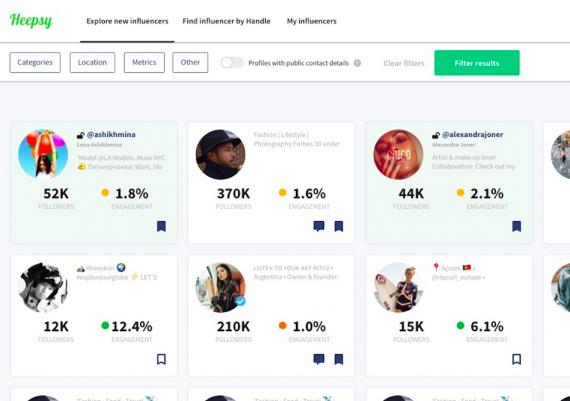 Discover which brands are interested on influencer marketing. 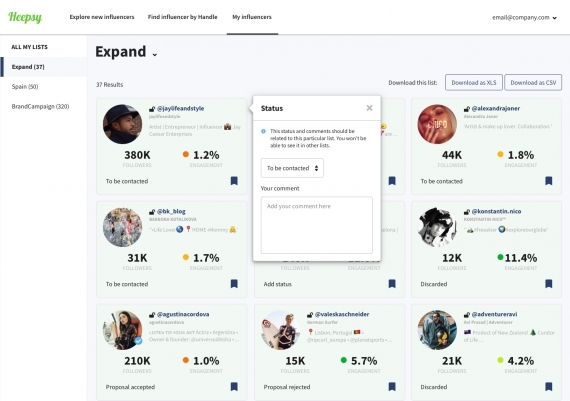 Check the influencers that are interesting for you and save them in lists. Check what collaborations are they working on. Go to our search tool and use our filters to find influencers like you in your category and location. Research the influencer landscape. Compare other influencer engagement with yours. Discover their estimated cost for their posts, what brands they have been mentioning and much more. Want to discover influencers like you? Your social media account just reached 5k followers and you see your peer influencers are starting to get paid by brands to promote their products. However, no one has contacted you yet and you might be wondering how to get collaborations with brands. Or better yet you have been contacted and you are wondering how much you should charge for a sponsored post. The first thing you should do is a thorough research of the influencer landscape. 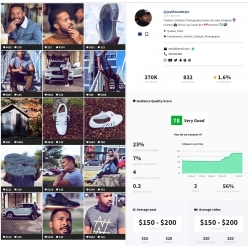 What influencers are collaborating with brands? 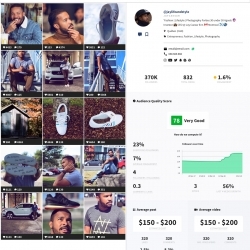 What are the top influencers in my industry and how much are brands paying for an influencer post? At Heepsy we let you find influencers in any geography and category so that you can find other influencers to see what they are doing right. Also, we offer you an estimated cost metric. You just need to enter an username (your own or someone you know) and we will give you an estimate of how much will a brand be willing to pay for a post. 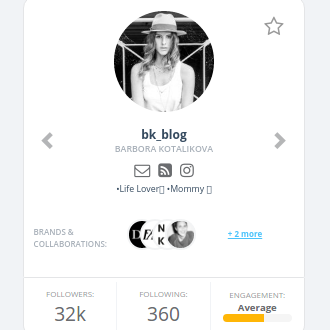 Also, our filters show other metrics that brands take into consideration when selecting influencers for collaborations. Follower number is not the most important factor to calculate your media value per post. In fact, the engagement is getting more important to evaluate the reach. Other metrics that marketers take into consideration when choosing an influencer are follower growth, like rate, follower to following ratio. Look up your media value and be more strategic about your brand collaborations with Heepsy.